Edited Note: MrLinky disappeared. I have no idea where he went. Maybe he takes Mondays off. I tried finding out what happened but the site will not even open in my browser. If you played along thank you so much! If you are planning on playing along this week no worries I have signed up for McLinky and already have the code generated and ready to go! Hopefully it will work. Hey y'all! Sorry it has been a week since my last post. Nothing much was going on and I did not want to bore you. Now we all have a cold and this mama has not been sleeping. Oh well that's how it goes. I do have some exciting news or at least exciting to me! I just made a new bloggy friend...Marla's daughter Mindy...and we agreed to a swap! I would include a link to her blog but its by invitation only. Trust me though when I say she rocks! I now have not one but two new bloggy buttons! I am so excited that you can now go over to the sidebar....go on over ya know ya want to.... and just grab my button for your blog! I have dreamed of my very own button so thanx Mindy!! Mindy also made me a button for Thrifty Treasure Thursday! You can go over to the side and grab it as well if you like. I am sooo determined to figure out Mr Linky but for now if ya wanna play along just leave a message in the comments section and I promise to stop by! 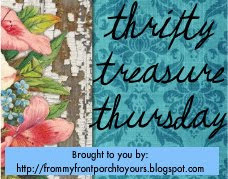 Now on to Thrifty Treasure Thursday! Back in the fall I fell in love with this initial wreath from Ballard Designs. 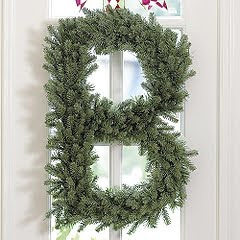 I just loved it but the price and the fact that it was not a year round wreath kept me from purchasing it. Back before Christmas I walked into Kirklands and they must have been reading my mind because low and behold what did they have!? They had boxwood initial wreaths! I was soo excited but that quickly turned into disappointment. After several weeks of checking back in they never received an 'F'. I finally asked and they said they were not going to get one in in an 'F'. Well this past Monday I went in and they had their big 40% clearance sale and they had the initial wreaths on clearance. Why would I get excited you may be wondering since they did not even carry an 'F'? This is why I got excited! I have no idea why it did not dawn on me before that I could easily make the 'E' into an 'F'. So for the price of one wreath I purchased two for $11 and change and quickly drove home to make my new 'F' boxwood wreath! All I did was take a pair of scissors and started chopping away. Little did I realize there was a thick piece of metal supporting the initial so I had to get the pruning sheers out since I do not own wire cutters. Now I have a perfect initial 'F' that I can use all year round! To secure the vine at the end I just used some floral wire. It was green but I sprayed painted it brown so you can not see it. Isn't it beautiful! Please ignore the several different paint colors on the wall. Its a project in the works! ;) I just placed it there so you could see the finished product. What treasures did you find/make this past week?? I'll get your buttons on my sidebar and link my post to your Thrifty Thursday. OOPS! Valance using leftover fabric and a bathroom redo coming up this weekend! oh I love your creativeity.. what a great idea to make your F from their E.. I followed Marla over here and wish I'd had time to do so earlier.. I'll be ready to participate next thursday for sure.. They look great Pamela! :) And I love the find! Really cute topiary initial. I love it. Thanks for inviting me to your party! Now, I would have never thought to do that! You are very clever!! Love that F & you're right, it will look fantastic all year round! Pamela, I just realized that Mr. Linky connected me with a past link, not the URL I put in. Hmmm...that happened over at Susan's Between Naps on the Porch also this week. She had to go in and manually change it. Weird, huh? Hey, they aren't being fair to all us "F" people! We are F's too, I'd never have thought of modifying an E, how clever you are! Hey Nola! Ya my mom even asked abt it at her Kirklands and they looked it up for her. They did not even make them in 'F'. Crazy! Marla what link are you wanting?? I have the curtain one pulling up. Great idea aboutmaking the E into an F. Smart! Smart! I love this blog. Such beautiful pictures. Keep up the good work. This is a great idea ~ I hope to join in this week!